Blue Jays pitcher Sam Gaviglio is Saturday’s Box-Toppers Player of the Day. Also Saturday, Reds pitcher Luis Castillo rises to fourth place in Box-Toppers season player rankings after earning National League Player of the Day honors. Plus, Diamondbacks pitcher Zack Greinke now has the sixth-most career Box-Toppers points since 1995, passing Albert Pujols on the “all-time” list, after earning Player of the Game honors Saturday. Christian Yelich of the Brewers is Monday’s Box-Toppers Player of the Day and rises to ninth place in season player rankings. Also Monday, Indians pitcher Trevor Bauer rises to first place in Box-Toppers season player rankings after earning American League Player of the Day honors. Tags Box-Toppers Daily Scorecard, Christian Yelich, Trevor Bauer, New Box-Toppers points leader, Cody Bellinger, Blake Snell, Teoscar Hernandez, Streak with at least 1.0 Box-Toppers point in a season, Clayton Kershaw, Pedro Martinez, Box-Toppers debut, Dwight Smith Jr.
Astros pitcher Justin Verlander is Saturday’s Box-Toppers Player of the Day, rising to ninth in season player rankings. Also Saturday, Yankees pitcher CC Sabathia ties Box-Toppers’ all-time record by earning at least 1.0 Box-Toppers point in 19 straight seasons after earning Player of the Game honors. 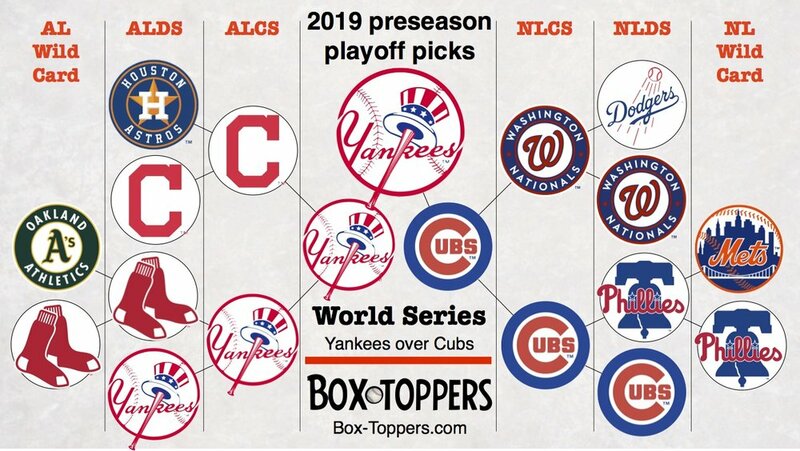 Box-Toppers picks the New York Yankees to beat the Chicago Cubs in the 2019 World Series. In addition, Box-Toppers projects the Yankees will win 111 games in 2019, one of four teams projected to win 100 or more games this season. All 2018 American League playoff teams are projected to return to the postseason, while three different teams are forecast for the National League postseason—the Nationals, Phillies and Mets. Nationals pitcher Max Scherzer leads two of Box-Toppers’ four main leaderboards and came within 2.1 Box-Toppers points of leading three of the four after the 2018 season. Scherzer has the most Box-Toppers points of any player over the past two seasons (50.1 over 2017 and 2018) and the most points of any player over the past six seasons (137.0 from 2013 to 2018). Scherzer finished second in overall points in 2018 with 25.1, just behind leader Rays pitcher Blake Snell (27.2). With Max Scherzer’s rise into Box-Toppers career points top 10 list during 2018, there are now six active players in the top 10, the most since 2008, when there were eight. Box-Toppers player tracking began in 1995 and the overall top 10 players in career points was composed entirely of active players until 2008. The number of active players on the list slipped to as low as two as recently as 2014, but grew to six on June 5, when Nationals pitcher Scherzer joined the list, rising to 10th place with 172.1 Box-Toppers points, displacing retired pitcher Roy Halladay. Scherzer finished the season with 181.8 points, ranked ninth. Nationals pitcher Max Scherzer leads players in Box-Toppers points since the start of 2013. Scherzer has 137.0 Box-Toppers points over the period 2013-2018, just 2.6 points ahead of Dodgers pitcher Clayton Kershaw, who has 134.4 points over that span. In fact, Scherzer unseats Kershaw from atop the six-year rolling Box-Toppers point total, a spot Kershaw has held at the end of each season since 2013, five straight seasons. Nationals pitcher Max Scherzer has more Box-Toppers points over the past two seasons than any other player. Scherzer has earned 50.1 Box-Toppers points over 2017 and 2018. He ranked second among all players in both seasons. 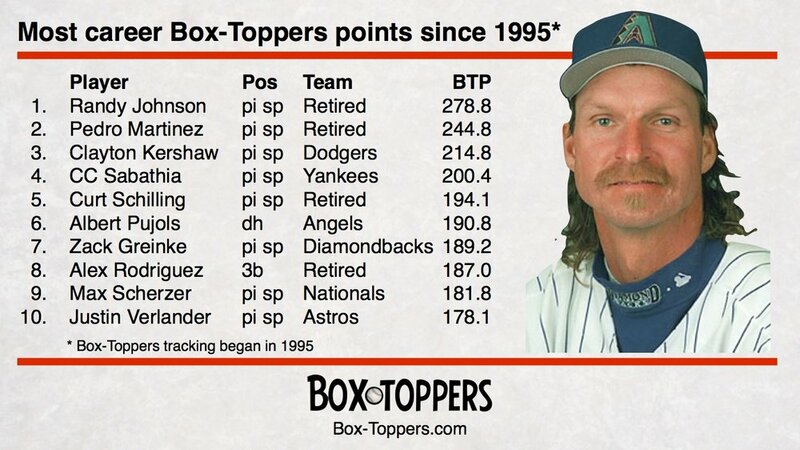 Randy Johnson leads all players in career Box-Toppers points and will continue to do so for the foreseeable future. The most likely rival to Johnson’s throne at the moment is Dodgers pitcher Clayton Kershaw who has 214.8 career Box-Toppers points, third among all players since 1995 and most among active players. Nationals pitcher Max Scherzer is Box-Toppers’ top-ranked player over both the past two seasons and past six seasons. Scherzer has the most Box-Toppers points over the past two seasons (50.1 over 2017 and 2018) and the most points over the past six seasons (137.0 from 2013 to 2018). Twins pitcher Ervin Santana had the biggest decline in Box-Toppers points from 2017 to 2018. Santana, who earned 16.1 Box-Toppers points in 2017 (ninth among all players), earned no points in 2018. His decline of 16.1 points was just ahead of Nationals pitcher Stephen Strasburg, whose 6.7 points in 2018 represented a 15.1-point drop from the 22.5 points he earned in 2017. Christian Yelich of the Brewers, who led National League batters in Box-Toppers points in 2018 with 11.5, was voted NL Most Valuable Player Thursday. And Mookie Betts of the Red Sox, who ranked second among American League batters in Box-Toppers points with 10.9, was voted AL Most Valuable Player. Teammate J.D. Martinez, who led AL batters with 12.5 Box-Toppers points, finished fourth in AL MVP voting. Blake Snell tops Box-Toppers list of the top 100 players in 2018. The Rays pitcher had 27.2 Box-Toppers points during the regular season, which is the 12th-highest single-season point total since 1995, when Box-Toppers tracking began. 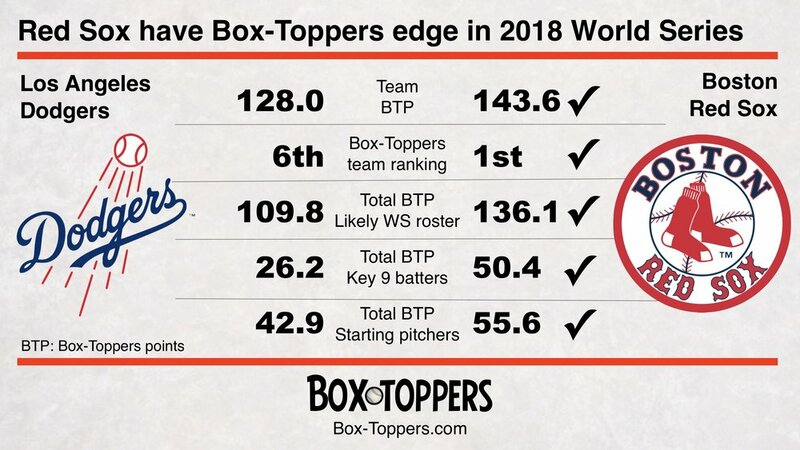 The Box-Toppers All-Star teams for the 2018 regular season are led by overall Box-Toppers points leader, Rays pitcher Blake Snell.